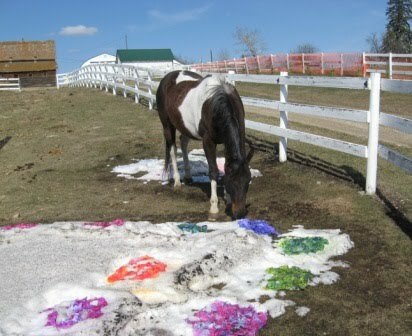 This is my horse checking out the fabric in his pasture. I have been dyeing fabric in snow banks. I get great texture on my fabric. 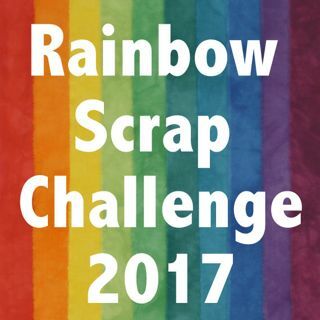 Now that it is spring, there is less and less snow. This snow bank is some of the last snow we have. There is a snow fence in the pasture, so the snow has gathered here. Last week we got more snow and lots of blowing on Thursday. 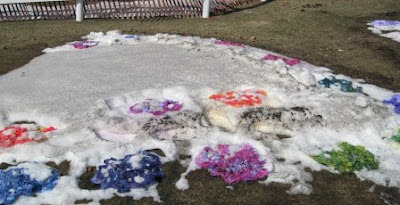 Check out April 6th post if you want to see more snow dyeing. I hope to take more photos of the finished fabric. I am washing it now.